Kirbie Goes to Hollywood: "What happened?" Sorry for the lack of posts everyone! I've been on vacation the past week with my wonderful boyfriend. I have to give him some credit right now because the man has been supporting the both of us this entire week - he bought my ticket out here and he refuses to let me pay for anything, but luckily I let him let me buy dinner one night and some frequent fro-yo runs. I don't know a lot of other 24-year-olds willing to do that. I'm just that lucky :) I am totally in love with the watch he bought me... I mean I have never received a gift like this from a boyfriend before. Anyway, "what happened" is not necessarily something a patient wants to hear during her wisdom tooth removal. I say "tooth" because all three were supposed to be removed this time (I had one out four years ago), but you'll see what happened to that idea later. Yesterday I had to leave lovely Dallas and return to my hometown of Georgetown to get my wisdom teeth removed. It's always bittersweet leaving Dallas because I have really grown to love it over the past year. Everyone always asks me "Don't you think Austin trumps Dallas?" Sure, there are wonderful aspects of Austin that can't be denied, but growing up just a few minutes away from our capital makes it less appealing over the years. Regardless, it is essentially home and I love it. Also, I need to mention I am hopped up on some high duty pain meds right now, so I apologize if some of this is jumbled together or makes no sense. My cousin Ashley loves me because she woke up at 7:00 to drive to big D, picked me up and turned right around to drive me to Round Rock. I was told to only eat half of whatever I usually eat for lunch. That idea was thrown right out the window because I had breakfast at 7:00 with Stu before he left for work so I was pretty hungry (grapefruits don't make the best snacks), so I ate my entire Schlotzky's sandwich. Anyway, it pays to be a rule breaker because once I got to the dentist they took a look at my teeth and let me know it was going to have to be surgery and not a routine wisdom removal procedure. I mean, I'm not easily scared and I have a very high pain tolerance, but throw the word surgery at me and I get a little antsy. They asked me if I had a big lunch. "...Yes?" "Great. Give her four antibiotics." Okay, this was getting serious - the pills were the size of dimes practically - so I took them and turned the TV onto SoapNet. Luckily The OC was on. The thing about the Dentist is they never fully "prepare" you. They're not like, "Can I take your things?" such as my purse, sunglasses, phone, etc. They just let it chill, so you're constantly waiting on them to finally "start" by taking those things. Yet it never happens. I remember being laid down in the chair and they placed a mask over my face. I started to inhale and it smelled like strawberry bubble gum. Then my whole body went numb. I had one wisdom tooth removed four years ago and when this part of the procedure happened I got terrified I was going to die so I refused to let my eyes shut. So I'm laying in the chair and inhaling the wonderful nitrous oxide when sounds start to repeat and it sounds like a DJ is scratching a record. I fall asleep right as my dentist comes in the room and I remember thinking, "Oh crap, they're starting and I'm not asleep!" but then went on a really trippy dream sequence. At the end, I was dreaming that they were talking about me waking up - and then I DID!!!! "What happened?" Dr. Roland asked me. He looks at his assistants. "What happened?!" "I dreamed I woke up." I sounded like a kid with a lisp because my tongue was expanding. The Dr. leaves and they keep asking me if my lip feels fat. Nope. "Really?!" Um, no... it doesn't. That response wasn't the best one to receive, especially since they're telling me beforehand that they have to cut open the gum and break the bone and all this other crap. So they let me sit and tell me to keep inhaling the gas. It must have been turned up because I started to grin thinking about the mask on my face. To me, it looks like a red, round ball, so I envisioned looking at myself from above and seeing something similar to Bozo the Clown. Anyway, they start working on me again except I can feel everything that is going on. So I'm groaning and making "ow" noises which normally I'd just shut up and take, but this time it was like they were ripping my tooth out of it's socket. Oh wait, THEY WERE. So I start to cry like any normal person high on drugs would. They stop and are like alright, we're going to give you this little blue pill. It will knock you out in about 15 minutes. Sounds great, sign me up. So I take it and swallow it down with water, choke for about a minute, and lay back down. They put the gas back on me. Fifteen minutes pass (I'm keeping track via The OC episode playing on SoapNet) and I'm still wide awake. The Dr. returns and they get back to work. OW. Crap. This hurt. Like BAD. The assistant is holding my hand and telling me to relax except try to relax when someone is drilling away at your mouth. I cry again. The Doctor stops. "I can't do this, she'll need to see an oral surgeon." Apparently every anesthetic they gave me wasn't working at all. They called my Dad and he convinced me to relax and let them remove this one and we'd worry about the other two later on. It makes sense, I mean.... the thing was almost out of my mouth, so leaving it in would have been ridiculous. Then I started crying because I felt like I was being a difficult patient and for making my parents worry and for making my cousin wait on me. Everything is so much more dramatic when you're on drugs. They had me inhale some more nitrous oxide and within five seconds he had ripped the thing out. It hurt but I wasn't inclined to make noise or cry that time so I suppose it was a good situation. So I have half of a swollen face, a blood-drool filled towel on my pillow and no pants on (the last part shouldn't be a shock). I just barfed up chocolate ice cream and I'm about to eat a mashed yam. And we're trying to figure out if I should even bother getting my top two teeth out or if I can stand to keep them. God knows I'll be going under if I have to get them removed. 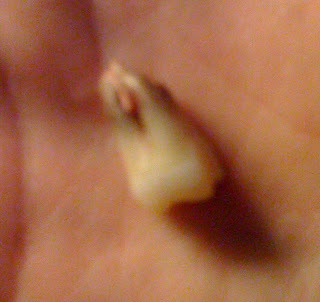 Oh, BTW, here's my tooth.